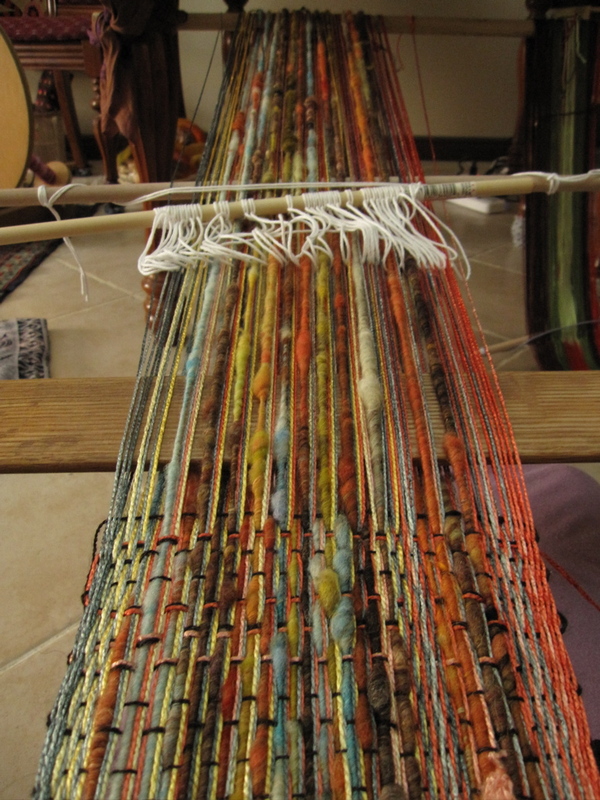 Meanwhile, I finished the weaving that you saw being warped a while ago. 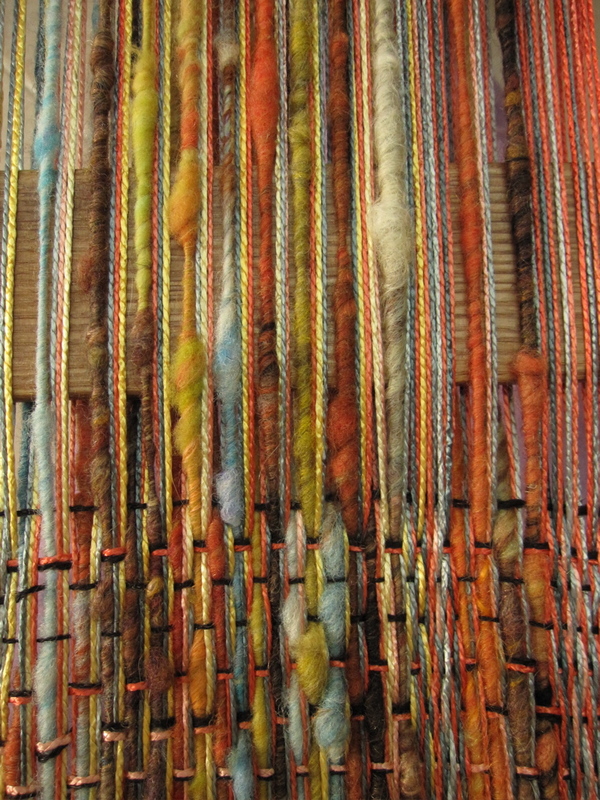 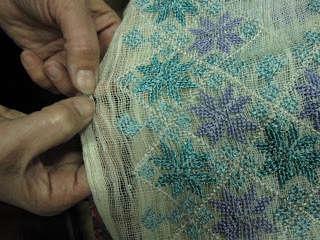 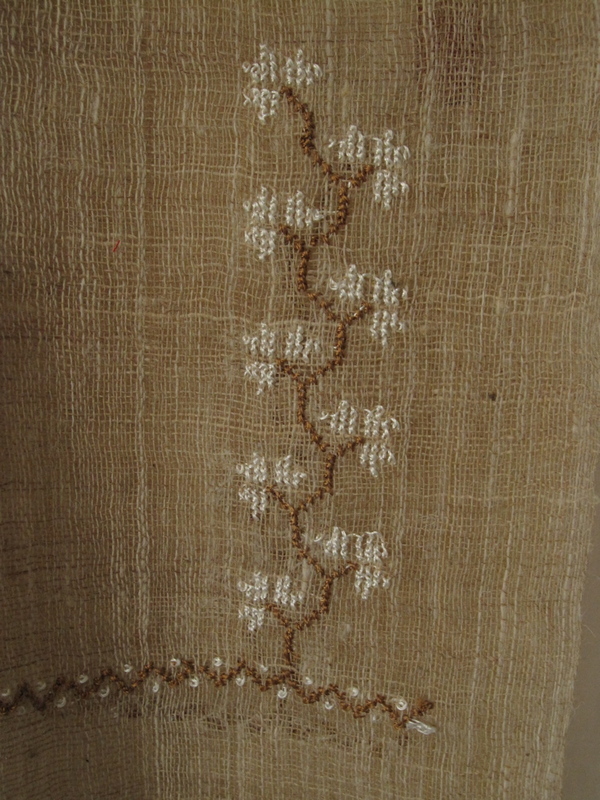 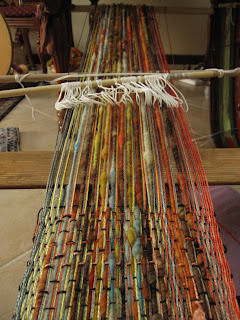 This was also woven on the backstrap loom, and I'm partial to photos of it in progress. 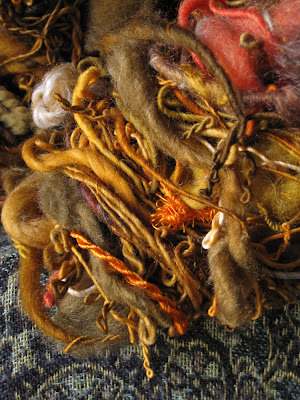 I’m happy to announce that my article Yarn: the Art of Twist is in the Spring 2011 issue of Fiberarts Magazine, due out very soon. 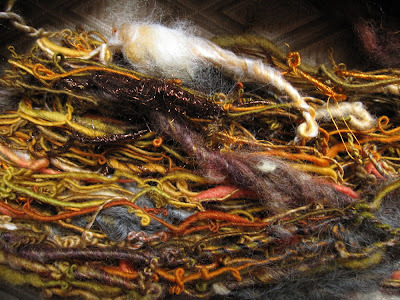 It is gratifying to have an outlet for writing about yarn as art, and I consider it a privilege to feature the work of handspinners I admire very much. 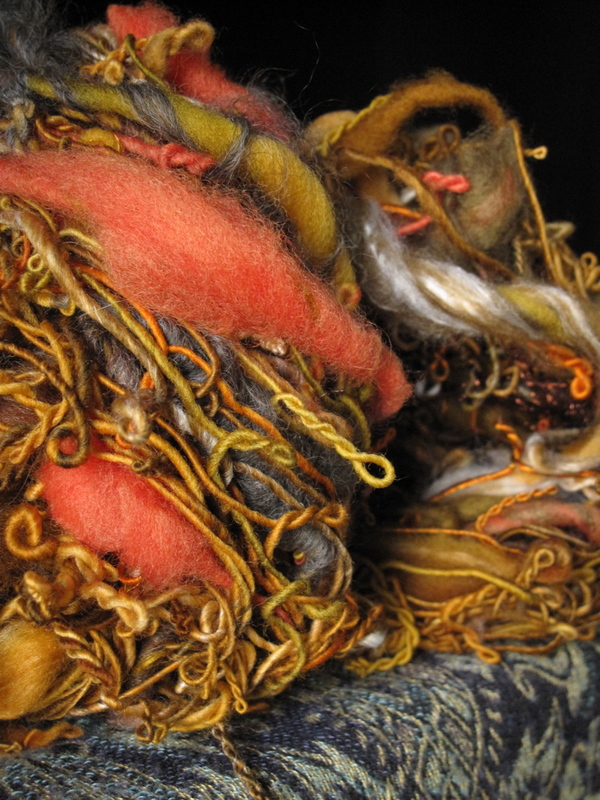 The word count was limiting, however, and too many things were grappling for inclusion, so I will write a bit more here, thoughts provoked by the finishing and photographing of my Rust yarn. Each step is so distinct: the palette selection, the prep, the spin, the skeining… then, the shoot. It’s hard to overstate the value of the photography, when one’s work is primarily being shared online. 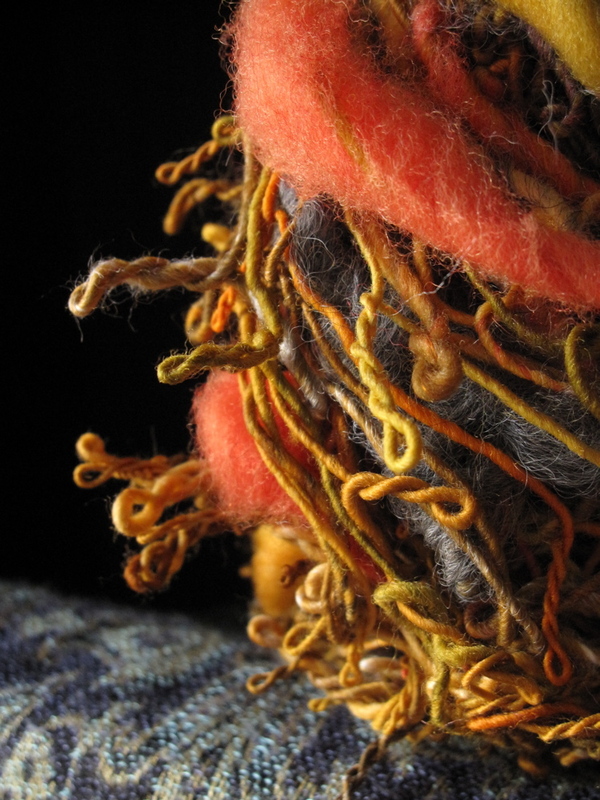 This is true for any artist, of course, but yarn is a unique animal in that its personality manifests differently depending on how it’s shown. 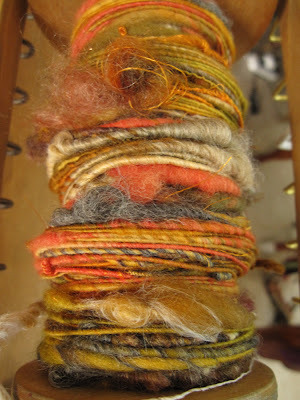 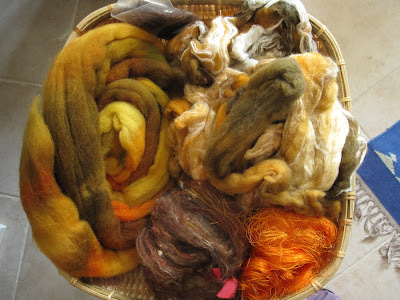 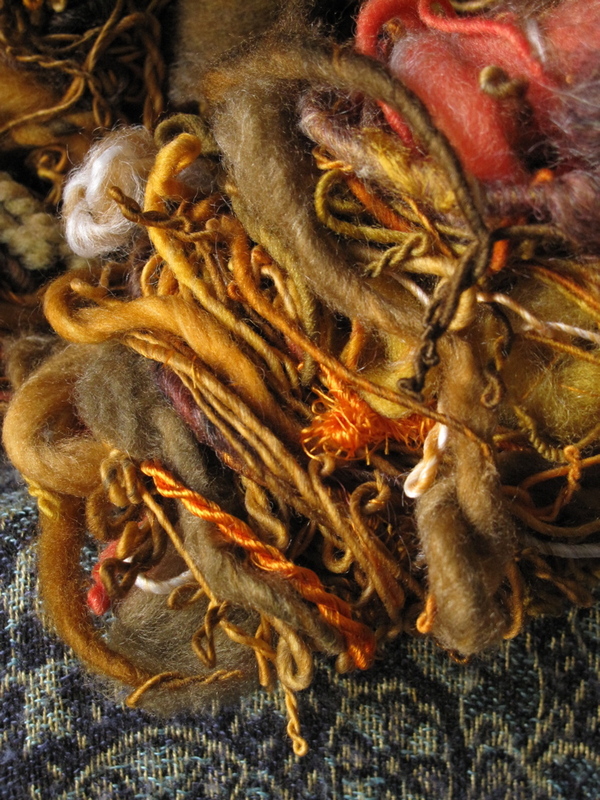 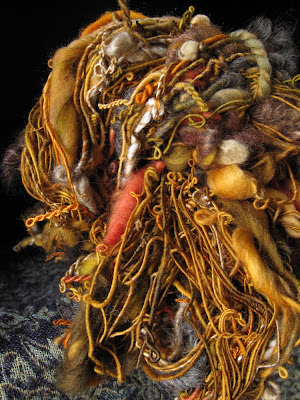 On the bobbin or in the skein, hanging loose or piled onto itself, stretched taut, in strands, in extreme macro – all these glimpses tell a different story. 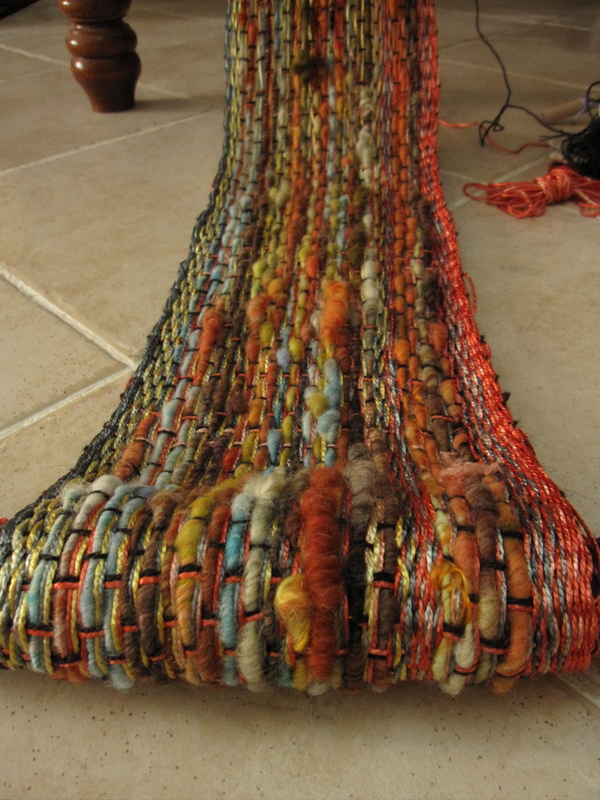 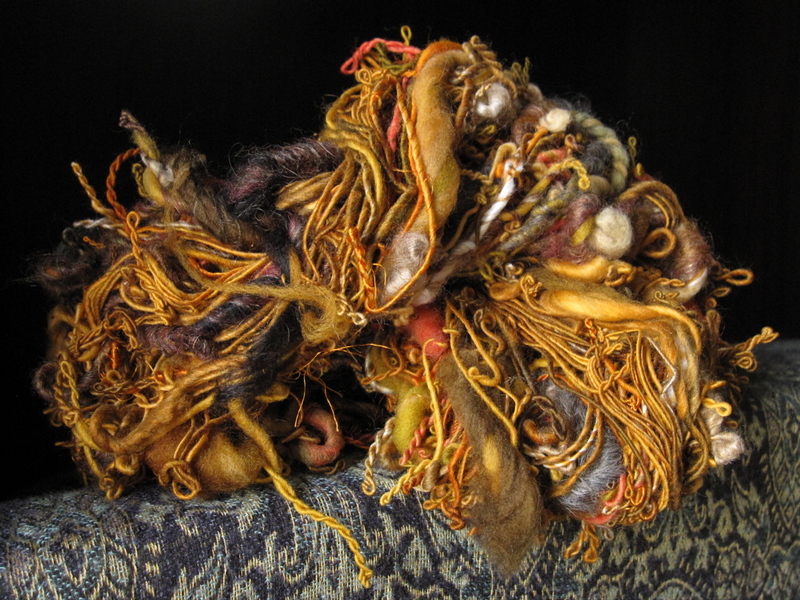 As a sculptural piece, the yarn contains movement and energy, and these elements are manipulated along with the fiber, to different intended (or maybe unintended) effects. 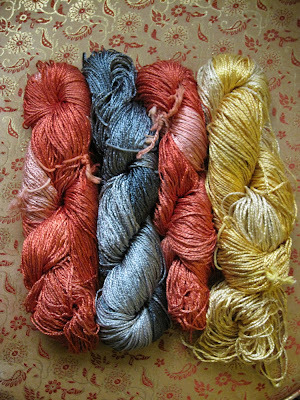 For me, it is always a suspenseful moment when I photograph the yarn. 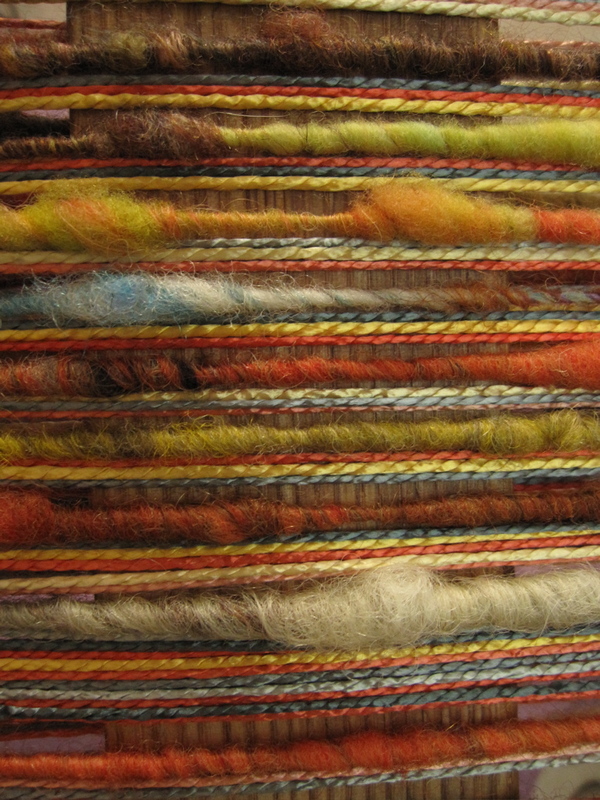 Will the colors show true in the light? Will the yarn cooperate? Will it work with me, and say what I was hoping it would say? 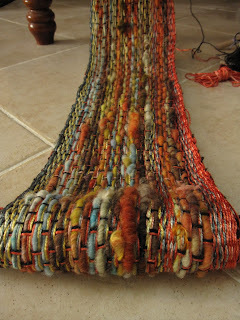 It is not an exaggeration to say that the way the yarn photographs affects whether or not I consider it a successful piece. Several factors determine whether I think of a given yarn as an artwork, and how it behaves in front of the lens is a big one. 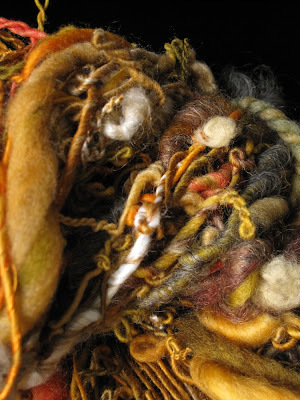 I guess this means the photos are a part of the work….. which would not surprise most of the art spinners I know, many of whom have been known to wish for wall-size enlargements of certain yarn images. This yarn is based on the glories of rust. 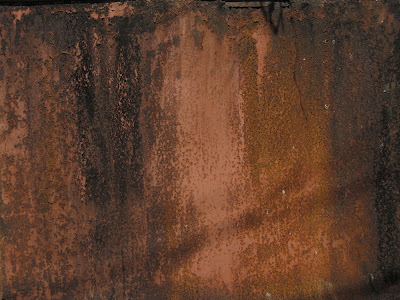 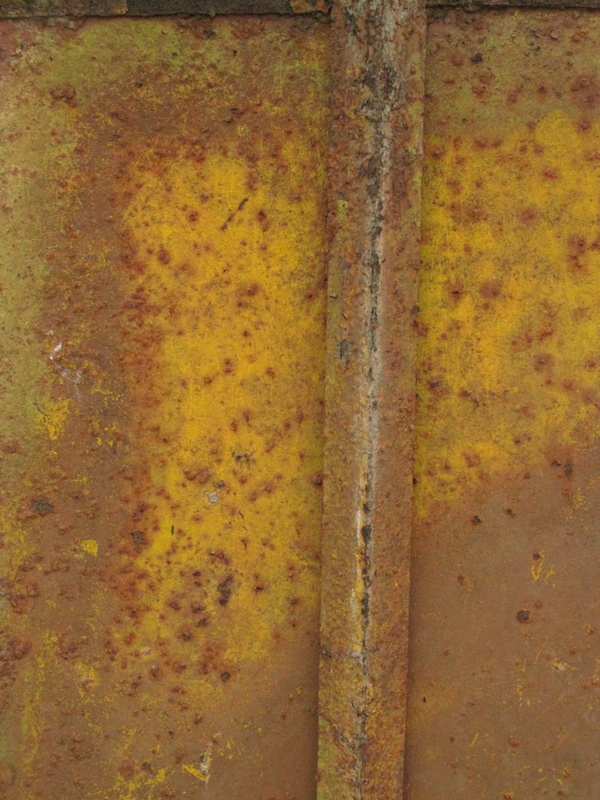 The rich colors, the corrosion, the unexpected beauty of something disintegrating over time. 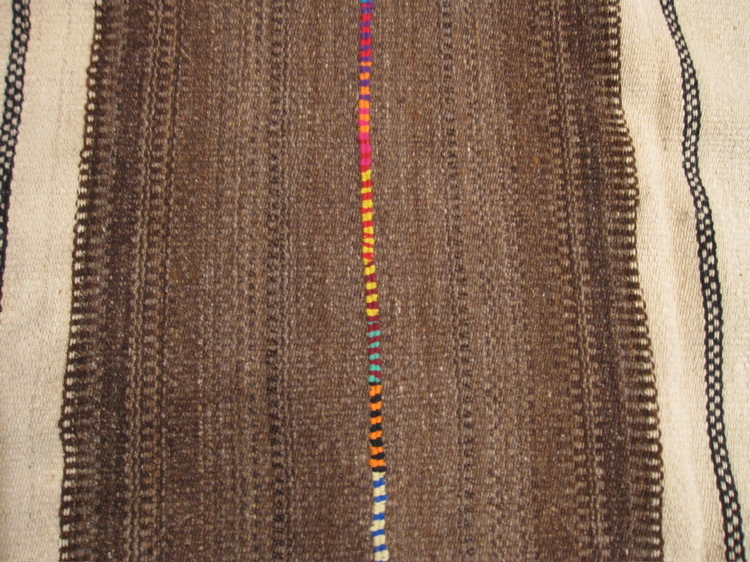 In this case, I think the yarn and I are getting along well. 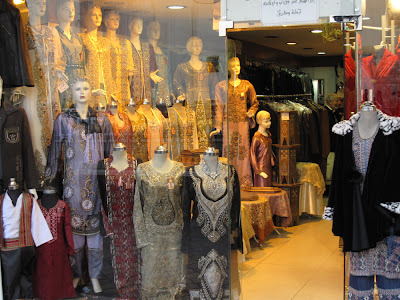 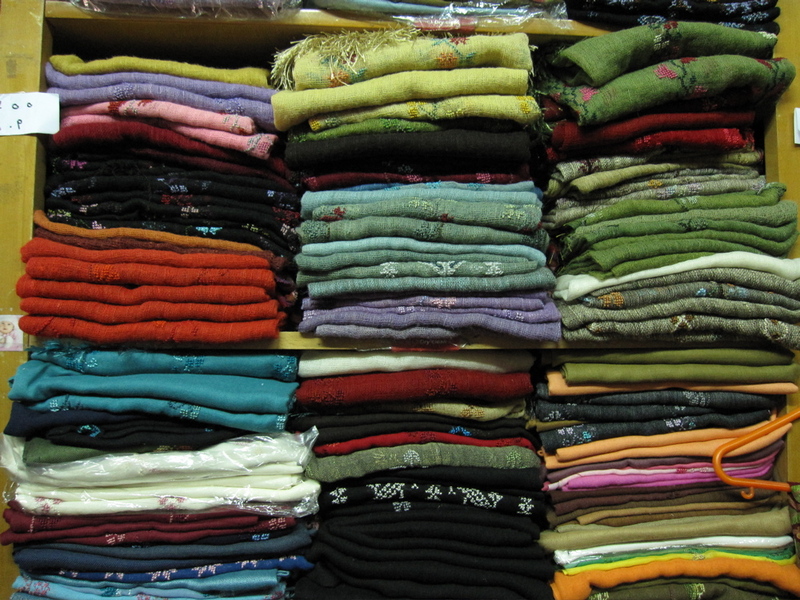 The most noticeable contemporary textiles are the shiny, glitzy clothing and accessories in the main market, Souq al Hammadiya. 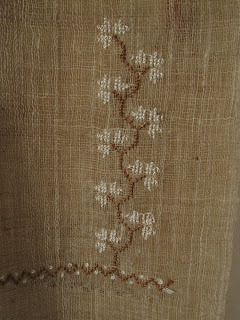 There seems to be no end to the glided embroidery available on caftans, tunics, tablecloths, and tissue box covers. 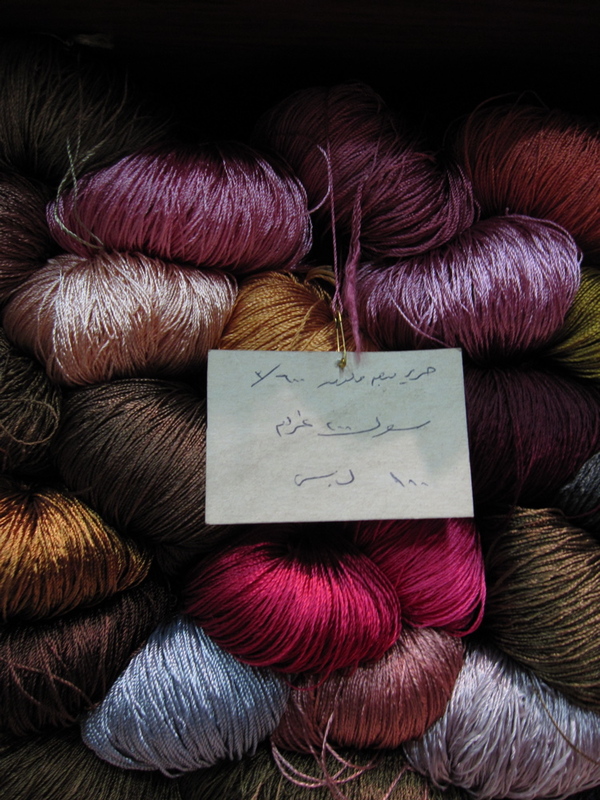 I was sure I did not need any of this kind of yarn, and just went in to pay respects (a friend has already brought parcels of Syrian silk to us in Doha, and it was fun to see her source.) 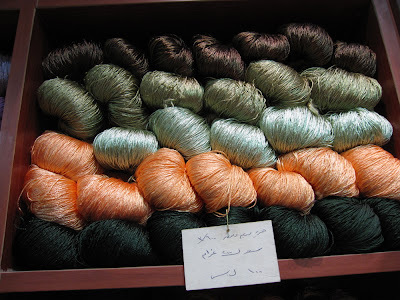 However, the owner of the shop was clearly skilled with color, and when he laid out several skeins, my resistance crumbled. 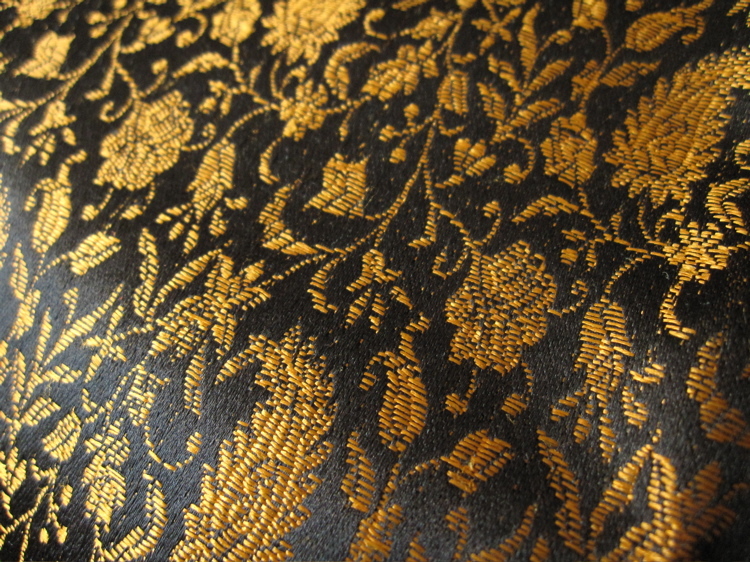 I bought these, which you may recognize from the warp in the previous post. 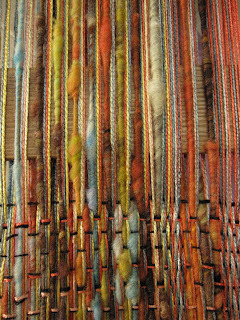 I had weaving on my mind in this shop, and suspected that these yarns would be nice elements, combined with handspun. 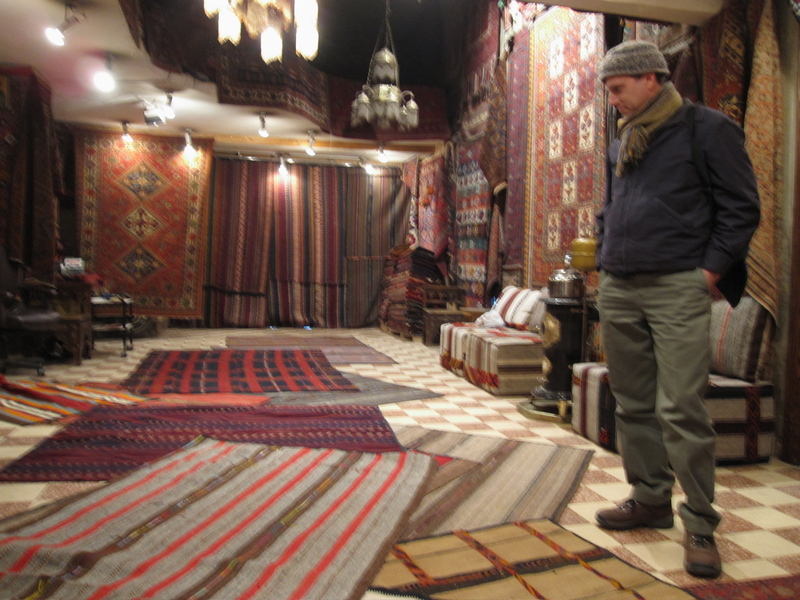 Then there was the rug shopping. 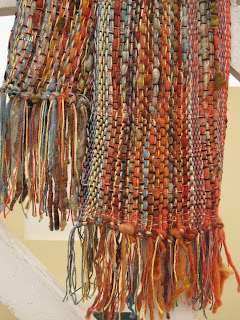 I was drawn into this space by a Bedouin floor-loom weaving that was hanging outside. 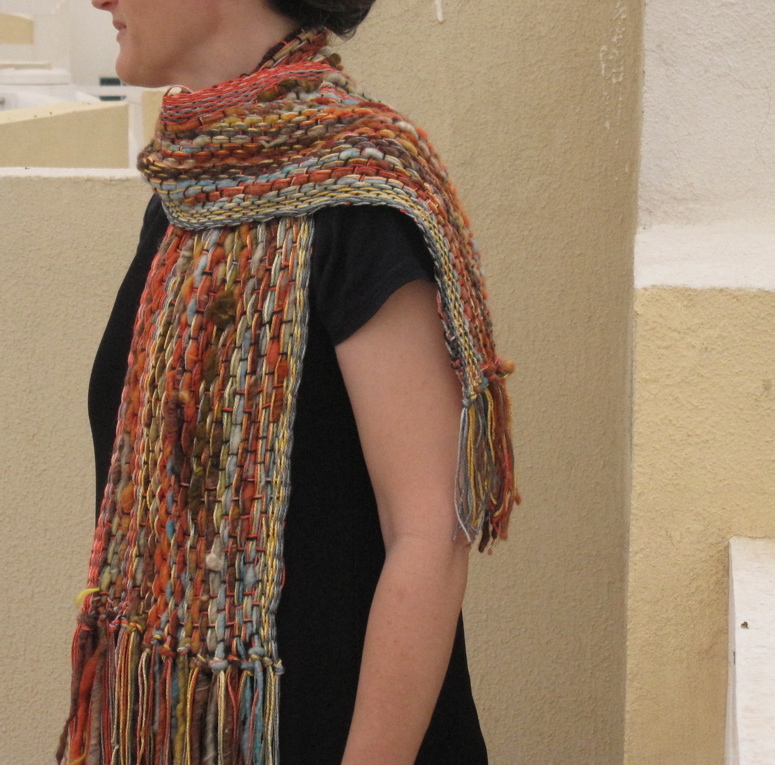 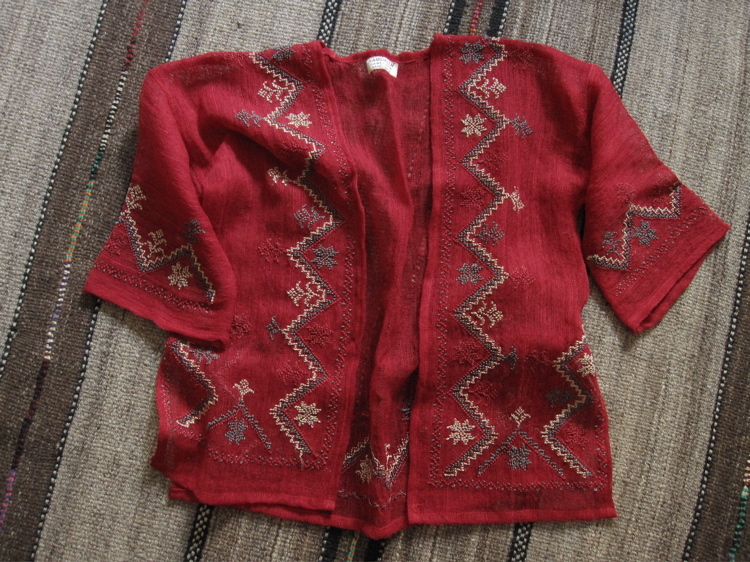 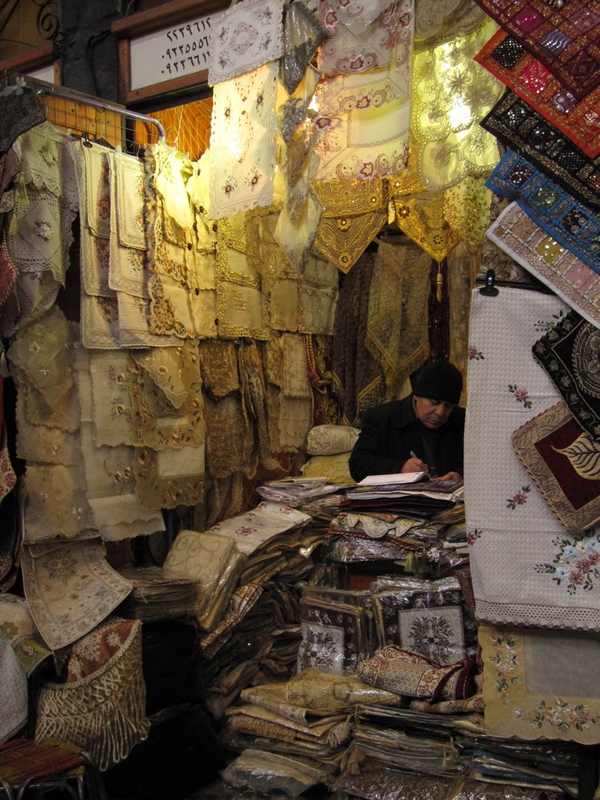 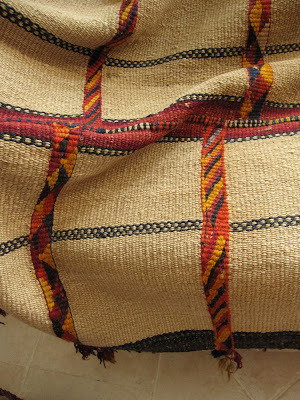 It was calmer than most, with natural colors and none of the weft-twining I've come to associate with Bedouin pieces. 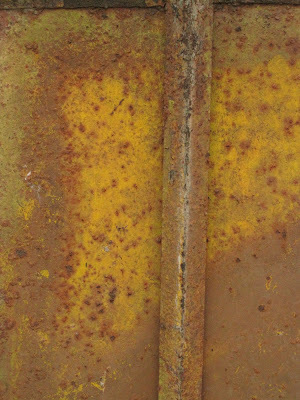 The owner opened the door, said, "We have more...." and sucked us right in. You could not see how spacious and rug-filled this place was from the street. The storefront is through the hanging rugs at the far end of the picture, and it's a small space with a desk and some chairs, where the proprietors hang out between customers. 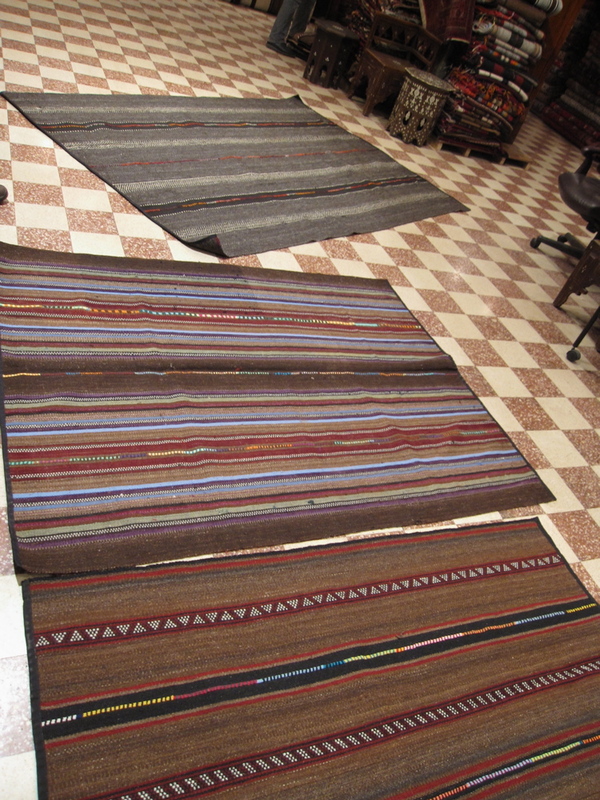 It's a wonderful, warm and delicious place to be, in here with the rugs. 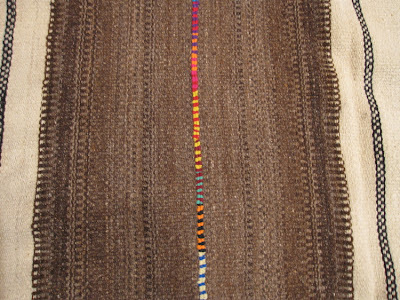 I loved the soft rhythm of the natural wool stripes, punctuated by the bright joining stitches and the occasional alternation of light and dark, which often looked accidental, as in this detail. 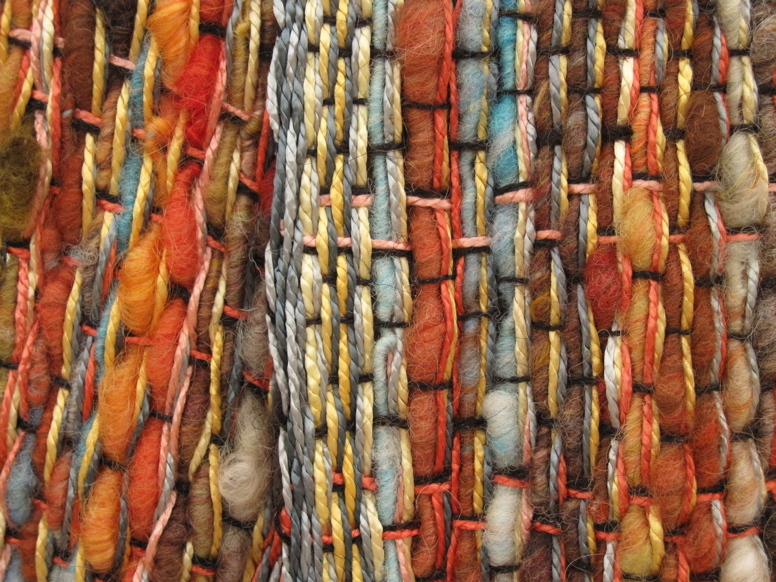 We bought a large, four-paneled rug of nearly 100% camel hair in natural shades. 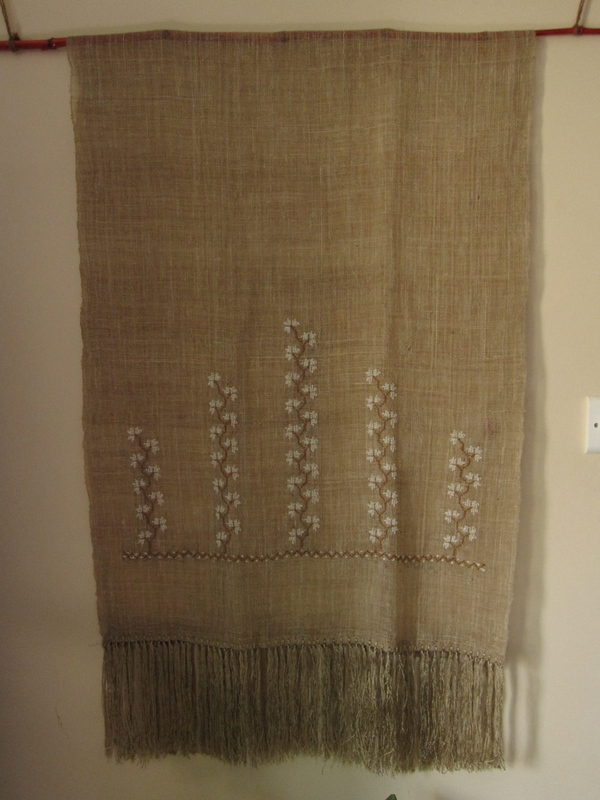 It has a bit of black and white, which are probably goat or sheep wool. 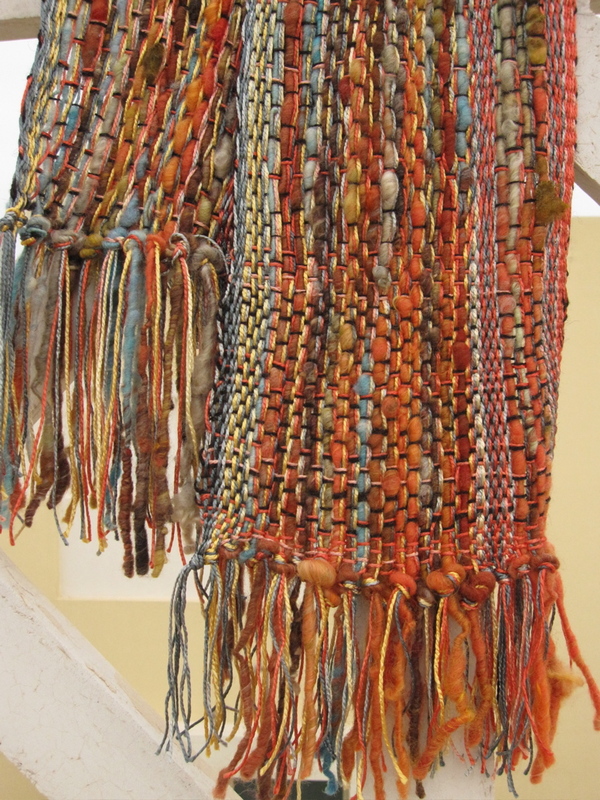 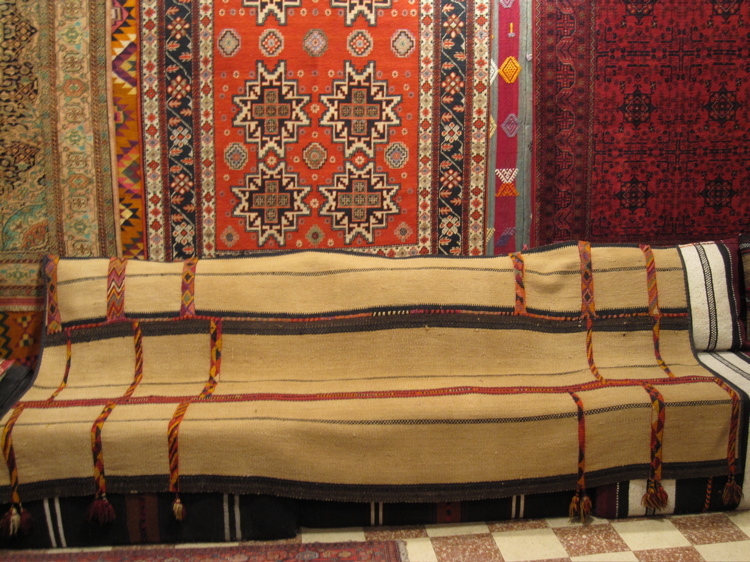 We also bought this Bedouin piece, which has the familiar weft twining in rich colors. 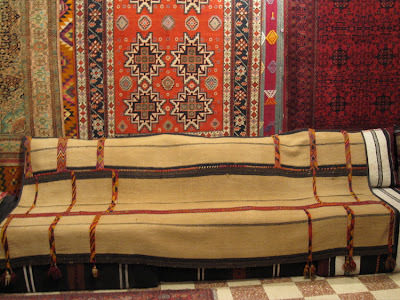 Now I need to set up my own majlis-style cushions on the floor, so I can cover them with this rug. 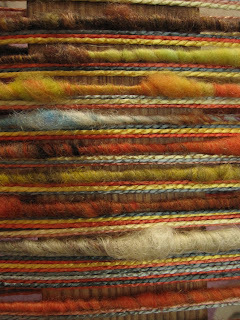 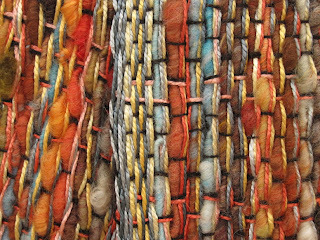 Speaking of camel hair, the next textile investment concerned handspun, handwoven camel hair fabric from Najaf, in Iraq. A designer in Damascus imports the fabric in bolts, then creates garments embellished with cross-stitch embroidery. I am forever grateful that my husband and I agree that handcrafted textiles are a worthy thing to splurge on. 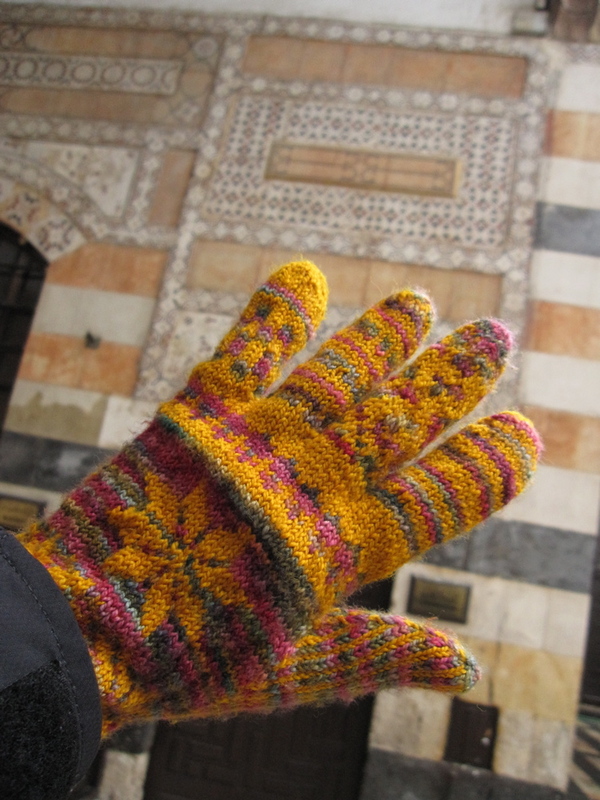 With all the stunning textile work around, I was especially glad for the cold weather which enabled us to rock some of my own handicraft. 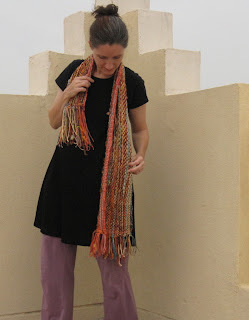 My husband wore a handspun, handwoven scarf, which was sincerely admired by the rug shop guys, and I finally got to wear my mind-altering gloves on a daily basis! 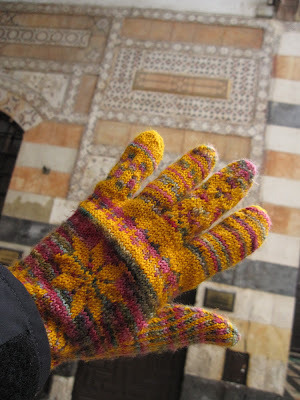 One of the high points for me was when a waiter, who had seen me knitting on a simple scarf, noticed the gloves as we were getting up to leave and asked if I made them. 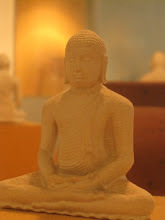 When I affirmed, he nodded and said, "Very good, very beautiful!"